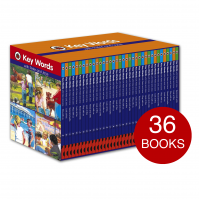 This collection is part of a series that covers the full range of phonics skills—from short vowels (Level A), to short vowels with blends and digraphs (Level B), to long vowels and diphthongs (Level C), to complex vowels and multisyllabic words (Level D). These books provide highly-controlled phonics practice and offer a complete basic course in decoding. Inclusive of audio CDs which help improve pronounciation! Listen to a sample here.